If you've got anything you want to say to Commander Shepard, you'd better say it in Mass Effect 3. Mass Effect 3 isn't the end of the Mass Effect series, but it is the end of Commander Shepard's role in it. BioWare's Mike Gamble says that although the studio has some "ambitious plans" for the series in the future, none of them involves the Normandy's commander. Speaking at Gamescom, Ray Muzyka explained how BioWare viewed the latest Mass Effect game. 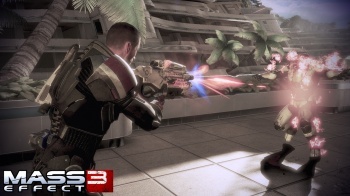 "Mass Effect 3 is simultaneously a couple of different things," Gamble said. "A thrilling and epic conclusion to the trilogy as we promised our fans we'd provide for Commander Shepard, but it's also ... an entry point for new fans and ... a brand new beginning." "After this, Commander Shepard's story is complete," producer Mike Gamble added. The Mass Effect games were originally envisioned as a trilogy, so it's no surprise that Shepard's story ends with Mass Effect 3. That's not really a bad thing though; once you've saved the galaxy from malevolent giant robots from space, it's hard to think of a way to top that. It's not like there isn't plenty of material for a new game either; the in-game codex is packed with details about different people and places. It's a universe filled with mercenaries, assassins, criminals and more, and there's plenty of scope to do something different.